Cosvision is really close now and I'm honestly kinda panicking here; I haven't even started packing yet and we'll leave on Friday morning or afternoon, oops. I'm just a bit all over the place and I'm currently super stressed about a shitlot of things, argh! But yeah, with this post at least I get one thing less to fret about, namely knowing that my Hatori costume works and looks as it should. Mostly. 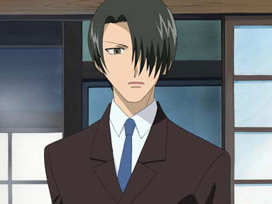 Hatori in the anime. Just to show what color reference I'm going with. It's heavily implied in the manga at least that Hatori is pretty much never seen wearing anything except formal wear. He also wears very expensive designer's suits but yeah, since I'm a poor student I can't do the same, obviously. ( ; 3;) I do have a few suit jackets but they're all second-hand findings so ssssch about that. I went with a black one since that's the standard color and at least he has a black one on the screenshot above. But yeah, I decided to roll with black this time since black is always black and my pants were black anyway. Hatori should technically have other colors too if that's the only things he wears lol; I'd be bored out of my mind if my whole wardrobe only consisted of black suits...! Note: Obviously (dirty) mirror photo. Hence why the covered eye is reversed. I crappily blurred out the whole background, since it was really distracting because of the mess and yeah, blended in too much with all the black too. Oh and yeah, ignore the blank stare please – I guess I did the 'memory suppression' on myself, lolololo. I haven't decided yet if I'll keep the jacket open or closed; Hatori does both though so it doesn't really matter in terms of character accuracy. 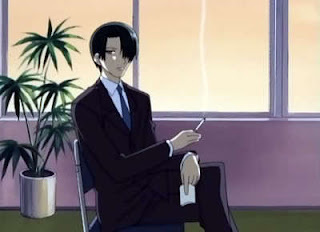 Oh well, whatever I do Hatori does not really have any signature traits that makes him stand out from all the other "handsome and properly dressed men" in anime so yeah, I might not be recognized anyway. x) I guess the only thing really making him a bit less generic-looking is the blocked left eye but yeah, that's about it. I hope having Firith running around as Ayame Sohma with me will help people know that I'm supposed to be a Sohma family member too and not just a random guy in a suit, lol. This is the last post you'll see from me before Cosvision! Hang on and I'll be back after 23-24th April with a con summary! Joo mä tiiän. xD En jaksanut alkaa pesemään sitä ku en löydä sitä oikee luutua siihen, lol. It looks great!!! Have lots of fun at the con!